Are You Chasing a Purple Squirrel? Too often, managers waste time chasing a purple squirrel—an ideal job candidate who, in reality, does not exist. A sales candidate may be skilled at selling, but can he or she relate to your industry sales cycle, costing systems, delivery schedules, and manufacturing processes? 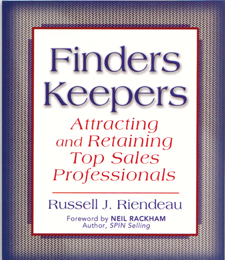 Is your organization attractive to the best sales and management personnel? Is there a magic commission formula that will keep talent on your team? What can you do about expensive turnover in your sales force? Why is it important to brag about sales reps who have left your organization? Why should you find and mentor your replacement? Bold Ideas That Will Impact Your Organization Now!